Pundits in The Hill, The New York Times, The Chicago Tribune, The Miami Herald, and mainstream media around the nation today are lamenting the 40-year-anniversary of Nixon’s declaration of the ‘war on drugs.’ Authors of these critiques include former President Jimmy Carter, former city of Seattle Police Chief Norm Stamper and other luminaries. Events and vigils protesting America’s punitive drug policies are being held today across the country, including a press conference at Washington, DC’s National Press Club. After 40 years it is apparent that the so-called ‘war on drugs’ is indefensible. As the Associated Press reported last year, even those in charge of waging this war it no longer can support it with a straight face. Nevertheless, the costs of the ‘war’ — both fiscal costs and human costs — continues to grow unabated. In 1970, hippies were smoking pot and dropping acid. Soldiers were coming home from Vietnam hooked on heroin. Embattled President Richard M. Nixon seized on a new war he thought he could win. His first drug-fighting budget was $100 million. Now it’s $15.1 billion, 31 times Nixon’s amount even when adjusted for inflation. — $20 billion to fight the drug gangs in their home countries. In Colombia, for example, the United States spent more than $6 billion, while coca cultivation increased and trafficking moved to Mexico — and the violence along with it. — $33 billion in marketing “Just Say No”-style messages to America’s youth and other prevention programs. High school students report the same rates of illegal drug use as they did in 1970, and the Centers for Disease Control and Prevention says drug overdoses have “risen steadily” since the early 1970s to more than 20,000 last year. — $49 billion for law enforcement along America’s borders to cut off the flow of illegal drugs. This year, 25 million Americans will snort, swallow, inject and smoke illicit drugs, about 10 million more than in 1970, with the bulk of those drugs imported from Mexico. — $121 billion to arrest more than 37 million nonviolent drug offenders, about 10 million of them for possession of marijuana. Studies show that jail time tends to increase drug abuse. — $450 billion to lock those people up in federal prisons alone. Last year, half of all federal prisoners in the U.S. were serving sentences for drug offenses. At the same time, drug abuse is costing the nation in other ways. The Justice Department estimates the consequences of drug abuse — “an overburdened justice system, a strained health care system, lost productivity, and environmental destruction” — cost the United States $215 billion a year. If elected, will you create a Presidential Commission to study marijuana—its Prohibition, Budgetary, Social, and Health effects, and to make recommendations for marijuana law reform? Federal law prohibiting marijuana dates from 1937. The Marijuana Tax Stamp Act was debated on the floor of the House of Representatives for just over a minute and against the wishes of organizations such as the American Medical Association. Cannabis, as it was then known, was a component of at least 28 patent medicines made by industry leaders such as Merck, Eli Lilly, and Squibb. With the passage of this law, not only did the legal sale and possession of cannabis end, but all American research into medicinal use of marijuana ground to a halt, and even the ages-old knowledge of marijuana as a medicine went into deep remission. 1) By October 10, 2008, America will have recorded its 20-millionth marijuana arrest, with people of color and the young arrested in disproportionately large numbers. It is time for a re-assessment of marijuana policy, plain and simple. 2) In addition to the pain and suffering visited by these millions of arrests on “we-the-people”, our government expends about $25 billion annually on its pot prohibition efforts, funds that should be expended elsewhere in the budget. 3) In addition to huge costs on expense side, we lose billions in taxation revenue, as well. Because, despite all government efforts to eradicate it, America’s vast underground marijuana market continues on, just as it has for the last seventy years, creating crime where there need be none, churning out billions and billions of dollars in untaxed and unregulated commerce. A tax and regulate posture as a method of control, verses the ‘no control/out of control’ situation we have today where kids can get marijuana more easily than beer—which alternative should America choose? 4) Marijuana use and purchase has been legal for the last 30 years in The Netherlands. This is the world’s great marijuana legalization experiment—and proof positive that a modern society will not collapse when pot becomes legal. Holland’s tightly regulated cannabis sales have created enormous tax revenues, while at the same time, usage rates for Holland’s teens continues to remain at just half of the usage rates of America’s teens even under our draconian prohibition model. 5) There are more than a dozen states over the last dozen years (covering about 1/5 of the US population) that have passed medical marijuana laws, mostly by voter initiative. ‘We-The-People’ created America’s state-by-state crazy quilt of medical marijuana laws, now what have ‘we’ learned from these experiments? 6) The modern use of cannabis/cannabinoids as medicine, buttressed now by 17,000 scientific studies, validates humanity’s medicinal use of cannabis that has been going on for as long as recorded history. In any rational world, a non-toxic, useful drug like cannabis would have been re-scheduled long ago by the federal government from Schedule I, where it now resides with heroin, to Schedule III with most prescription drugs, or lower. Why have the vested interests blocked cannabis from being rescheduled? 7) On 10/07/03 America’s own Department of Health and Human Services (HHS) received US Patent #6630507 for the use of marijuana’s active ingredients under the title, “Cannabinoids as antioxidants and neuro-protectants.” While HHS filed and supported this application, at the very same time, in other executive-branch Cabinet-level offices, at the ONDCP and the DEA, their legislative charters direct them to fight all use of marijuana as a medicine (the charters contain no standards to correct this prohibitionist posture if marijuana is shown scientifically to be useful as medicine). Either the HHS or the DEA/ONDCP must be wrong. 8.) A Presidential Commission hearing on the subject of marijuana law reform is a necessary exercise in government bureaucracy oversight, and is simply good government. America, after our 20-millionth marijuana arrest—is that amount of human wreckage not enough? How much longer must our government pursue its failed policy of marijuana prohibition? Presidential candidates McCain and Obama, show some guts, show some leadership and take the pledge: when you are elected, you will form a Presidential Commission via the National Academy of Sciences, or a like objective review body, to study marijuana. NOTE: Now, all you fellow voters out there in Blog-ville: Help me out with this. The Shafer Commission needs a 21st Century update. Does anybody think we need 10 or 20-million more marijuana arrests before Congress and the White House wakes up and changes our failed marijuana policies? The Supreme Court has told us repeatedly not to expect a judicial ruling to fix this social disaster; the change, the correction, must come legislatively. Well, 20-million marijuana arrests is enough and a Presidential Commission is what’s needed at the onset of the next president’s tenure to provide the political cover and scientific validation for members of Congress to find the guts to take the votes needed to reform this sorry mess after 70 long, shameful, and pathetic years. America eventually found the guts to end slavery, a social institution in place for over 200 years, evil and vile in its consequences but fiercely protected by special interests, even state governments; America can find the guts to end marijuana prohibition. America’s 20-Millionth Marijuana Arrest – Coming To Your Home Or Person? An odometer roll over effect of sickening proportions is about to happen this October: American law enforcement will make its 20-millionth marijuana arrest. Regrettably however, our country will not be one step closer to any solution of this “problem” than we were when the federal government first started arresting people for cannabis seventy-one years ago today, with the first federal cannabis prohibition arrest of Samuel Caldwell. 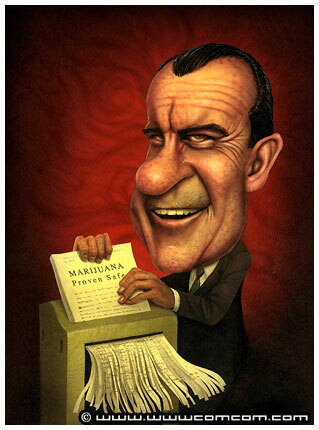 Halfway through this epoch in American history known as cannabis prohibition, Richard M. Nixon’s own handpicked Shafer Commission studied cannabis for nearly two years and concluded: no criminal penalties for adult possession of 100 grams of marijuana. Nixon was shocked by their findings and tried to bury the Shafer Commission’s report. Nixon instead proceeded with the “don’t try to confuse me with the facts, I’ve got my mind made up” approach to governance, and the full-scale war on cannabis commenced. After four decades, this institutionalized war on ganja and its users grows larger with each passing year. This war on otherwise law-abiding cannabis consumers has created literally millions and millions of unnecessary tribulations, taxpayer costs and casualties. In the period 1965-2007* there were 19,342,363 arrests for cannabis offenses, 89% of them for the possession of a small quantity of cannabis. Just before Election Day 2008, cops will arrest their 20-millionth man (or woman) for cannabis. And if you’re a regular ol’ cannabis consumer or a medical cannabis patient in need of one’s medicine, that tragic 20 millionth arrest could be you! Could be it be me, or one my loved ones! At the current pace of arrest, the 20-millionth cannabis arrest will happen by Oct. 10, 2008, within a week of the 71st anniversary of America’s very first federal cannabis arrest of the terminally ill Sam Caldwell in 1937.
Who will he or she be, this unlucky person? Who will be the 20,000,000th victim of arrest during America’s cannabis prohibition? Watch out! It could be you! *1937-1965 marijuana arrest data is sketchy, but this adds many tens of thousands more arrests to the total. 2007 was the worst year on record with a total of 872,721 marijuana arrests, up 5% from 2006. **The numbers of Americans arrested for marijuana offenses now are so huge, perhaps the only way to get a grip on the humanity of this prohibition-driven social disaster, is to think of just a few of the people who have paid the ultimate price since I joined NORML’s Board of Directors in 2004, those who actually lost their lives in the enforcement of cannabis prohibition. John Walters, Bush’s Drug Czar, appearing on C-Span recently said, “We didn’t arrest 800,000 marijuana users…that’s [a] lie… The fact is today, people don’t go to jail for possession of marijuana. Finding somebody in jail or prison for possession of marijuana is like finding a Unicorn. It doesn’t exist.” Well, Walters is either lying or not reading his FBI Crime Reports, or both. Please, take an extra moment and look through this list of four cannabis prohibition victims to see if you can find a ‘Unicorn’. 1) Jonathan Magbie, RIP: Washington D.C., died Oct. 30, 2004. A wheelchair-bound, 28-year old, African-American paraplegic who needed a respirator to breathe at night. Jonathan was sentenced to 10 days in jail for the possession of one single joint. His mother tried frantically for days to get Jonathan’s respirator to him through the jail’s paperwork. He died on the fourth day of his jail sentence from respiratory failure, just a few miles from the White House, ONDCP, DEA and other multi-billion federal bureaucracies waging a war on cannabis, when in stark reality their war is directed at folks like Jonathan Magbie. 2) Timothy Garon, RIP organ transplant patient from Washington State, died May 1, 2008. Timothy was first on an organ transplant recipient list until a prohibitionist medical administrator busted Timothy off the list because Timothy tested positive for the medical marijuana that had been legally recommended and administered by his own doctor. Timothy died in Seattle while his case was under appeal. 3) Rachel Hoffman, RIP, 23, Tallahassee, Fl was last seen alive on May 7, 2008. After two small quantity pot arrests, and a search of Rachel’s home that found a little more, the cops forced Rachel to go undercover without telling her parents or lawyer, by using the fear of the much more serious charges that might be filed against her if she didn’t do what the police demanded. The cops then placed Rachel on a baited hook and went trolling for sharks. The Tallahassee police department sent Rachel out to try to make a crack and firearms buy. Rachel Hoffman was found dead in a nearby county two days later. Samuel R. Caldwell, RIP, America’s first federal marijuana arrest, Denver, CO, Oct. 5, 1937. Arrested for selling two joints the day federal prohibition laws went into effect and was sentenced just two days later to four years in Leavenworth. Sam died of stomach cancer before his sentence was up. Sam Caldwell, America’s first incarcerated medical marijuana patient! Just four ‘Unicorn’ sightings from America’s 20-million marijuana arrests…and remember: 872,000 annual cannabis arrests, 2,390 arrest per day, 99 arrests per hour, one every 37 seconds. Just imagine how many more ‘unicorns’ there are, and are you like me when I say I’m insulted that a cabinet level officer in the Executive Branch has to lie to downplay the negative and costly effects of his $25 billion a year bureaucracy’s failure to actual control cannabis cultivation, sales and consumption. Hey Walters, how about some tax stamps for cannabis consumers just like your friends in the alcohol, tobacco and pharmaceutical industries enjoy? While the staff at NORML and the NORML Foundation assiduously avoid including funding requests in their blog posts and news alerts, as a NORML Board member I’m asking you to join the other board members and I in helping to expand NORML’s uniquely important educational, legislative and litigation programs—as well as allowing the national office to be as supportive and responsive as possible to the organization’s growing networks of both state chapters and lawyers. I will be moderating a panel at NORML’s upcoming 37th annual national conference in Berkeley entitled: What If We Arrested 20 Million Americans—And No One Cared? These public conferences are the most important political gatherings of the year for the cannabis law reform community and I hope you, your family and like-minded friends can join us October 17-19. Conference details found here.